The Airedale was bred originally to hunt otters. It was also called a "Waterside Terrier" because of this connection to hunting otters. Like many terriers, it has a 'broken' coat, which requires regular hand stripping to maintain the coat and distinctive square terrier shape. 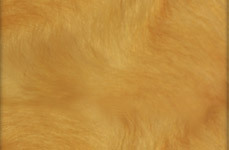 A broken coat is a harsh, wiry topcoat with a soft, fur-like undercoat. Broken-coated breeds do not shed their coats as much as smooth coated breeds, and are therefore less likely to cause allergic reactions in people prone to dog allergies. Stripping is the correct process for grooming an Airedale, using a small serrated edged knife to pull out loose hair from the dog's coat. Airedales who aren't being shown are often clipped with electric clippers. This process, while easier on the dog and the groomer, softens the coat and fades the color, and sometimes causes skin allegies for the dog. This is because the loose hair that would normally moult is cut, so the roots remain within the hair follicles. The correct coat color is a black saddle, with a tan head, ears and legs; or a dark grizzle saddle (black mixed with gray and white). Both are acceptable in the AKC breed standard. 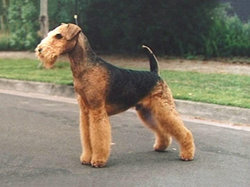 The Airedale's tail is usually docked (surgically shortened) within five days of birth, but this is not a requirement of breed standard authorities. However, to show an Airedale in the United States, the tail is expected to be docked. Airedales generally have black gums, a condition that would indicate asphyxiation in many other dog breeds. Additionally, Airedales' teeth are the largest among Terriers. The Airedale can also be used as a working dog and also as a hunter and retriever. However, it is typically an independent (stubborn), strong-minded dog with a great sense of humour. For those who can laugh along with their Airedale, patience will be rewarded as they have been known to reach great heights in competitive obedience, dog agility, and Schutzhund. The Airedale is also a reliable and protective family pet. The Airedale is relatively free of inherited diseases except for hip dysplasia in some lines. Airedales, like most Terriers, have a propensity towards dermatitis. Allergies, dietary imbalances, and under/over-productive thyroid glands are main causes for the Airedales itchy skin. Dogs of this breed usually live for around twelve years, but have been know to last until the age of seventeen. Prices current as of last update, 04/23/19 10:35am.